From the author of the best-selling Library Lion comes a funny, heartfelt new picture book about embracing the unusual, green scales and all.Sally’s class is doing a science project, and Mrs. Henshaw is handing out eggs for hatching. "Mine looks different," says Sally. When Sally’s egg cracks, what emerges is something green and scaly with big yellow eyes. Argus isn’t like the other chicks: he isn’t small and fuzzy, and he doesn’t like seeds and bugs. He’d rather eat other chicks (or children, as he grows even bigger). Watching the other kids playing with their identical chicks, Sally wonders, would she be better off without Argus? 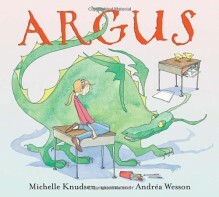 With sly humor and a subtle tug at the heartstrings, Michelle Knudsen hatches a story about learning not just to tolerate, but to love what is different, while Andréa Wesson’s endearing illustrations bring the tale to life with quirky details and offbeat charm. Cute, classroom romp about being different. Recommended!